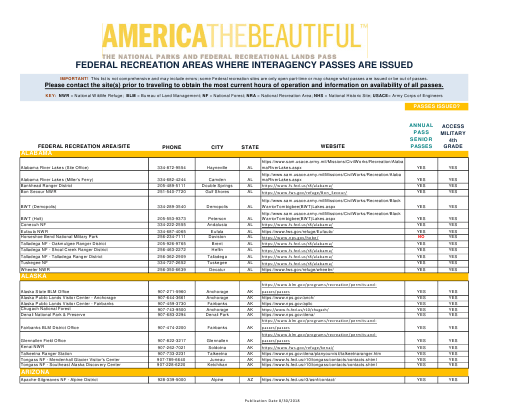 This "Federal Recreation Areas Where Interagency Passes Are Issued - America the Beautiful" is a part of the paperwork released by the U.S. National Park Service specifically for United States residents. The latest fillable version of the document was released on August 30, 2018 and can be downloaded through the link below or found through the department's forms library. This list is not comprehensive and may include errors; some Federal recreation sites are only open part-time or may change what passes are issued or be out of passes. Please contact the site(s) prior to traveling to obtain the most current hours of operation and information on availability of all passes.